After finally settling into my new house and a crazy period at work being over, I need to get stuck back into blogging! I'm going to Berlin next weekend and will need research a bit more on that. How time flies! So this is a post dedicated to one of my (new) housemates, Miss Laura. I'm actually living with two Lauras, and the other Laura is also super talented, but I'll save that for another post. 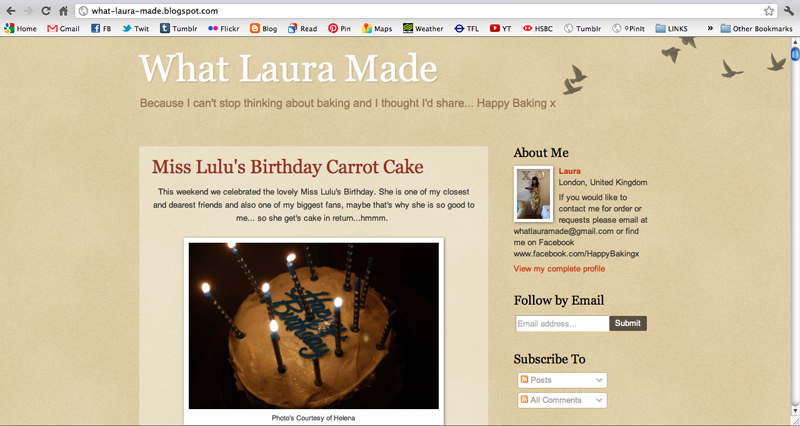 This Miss Laura is a very talented baker. If you're in the London area and ever need anything made, give Laura a shout. I can guarantee her baking is amazing!! Now we're living together I think I'll be her official baking photographer. Most recently she made a 3 layered carrot cake for our friend Lulu's birthday. A mojito cake for our ladies' party. A blueberry bundt cake for Lulu's boat BBQ.